The Atlanta Falcons opened the scoring with a field goal against Buffalo, but the Bills would immediately respond with a QB Tyrod Taylor touchdown pass to WR Jordan Matthews. Atlanta regained the lead on a HB Devonta Freeman 1-yard touchdown run to put the Falcons up at halftime. Things shifted towards the beginning of the third quarter when QB Matt Ryan fumbled as he was sacked and CB Tre’Davious White picked up the ball and ran it back for a touchdown. Despite a Ryan touchdown pass to WR Justin Hardy, the Bills edged out a 23-17 win on the heels of three fourth quarter field goals. With that, we give you our PFF exclusive takeaways from the contest for each team. Another day, another solid showing for Taylor. With the running game enjoying success Taylor was in his element, able to work off play action (69.2 percent of his yards came via play action), and never putting the ball in danger. Ultimately his ball security was better than his opposing number, and that is why the Bills won. 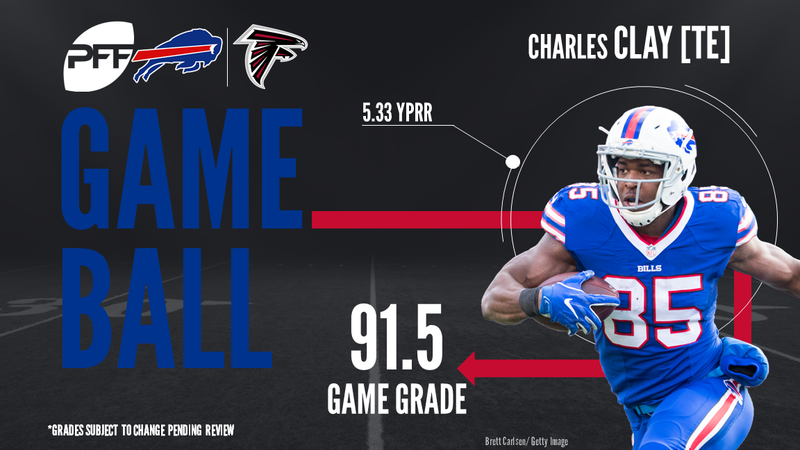 He’s not been the prolific weapon the Bills paid him to be, but Clay showed what he is capable both with ball in hand and blocking on the edge against Atlanta. His 112 yards led the team and it was built on some good work after the catch. He forced three missed tackles as the Falcons struggled to bring him down. His 5.33 yards per route run leads all tight ends so far this week. A front-runner for Rookie of the Year, White just keeps making plays. He was alert enough to scoop and score on a Falcons fumble but he also has another excellent day in coverage. Thrown at eight times, he allowed just 18 yards and broke up a pass for good measure. There aren’t many edge defenders who have such consistent joy against Jake Matthews, but Hughes had himself a day. His forced fumble was arguably the pivotal moment in this contest, but he also added a hit and four hurries in a display of his excellence. Should Falcon fans be concerned? It’s not that Ryan is playing badly, but he just isn’t close to hitting the heights of last year. His turnover ratio took another battering, however there was only one turn over he should be disappointed with, as he had a third pick in two weeks that came off his receivers hand. The problem, and it wasn’t helped by losing his top two receivers, is Atlanta just aren’t throwing the ball downfield successfully. Four attempts of 20 yards or more in the air ended with as many completions to Buffalo as it did Atlanta (one). It was the biggest question mark on the offensive line heading into the season, and after a rough start the former sixth-round pick is starting to settle down. He had a good battle with the Bills talented defensive line, regularly gaining position in the running game and while he did get beat for three hurries, they weren’t with the kind of speed that has been too common place early in the year. This game was another step forward. Jarrett did his best to get his team the win with three defensive stops to set up the Falcons getting the ball back on three consecutive plays. It highlighted a good day where he gave Eric Wood a number of problems. He ended the day with two hurries (and a hit called back on an offensive penalty) as he continues to be the Falcons most consistent performer up front. While Riley made a good start to life at the NFL level, he couldn’t keep it up against the shifty Shady McCoy. His tackling was a huge problem as he missed four tackles, while he also got beat deep down the field for a big completion.